A beautiful hint of pink baby children bonnet. 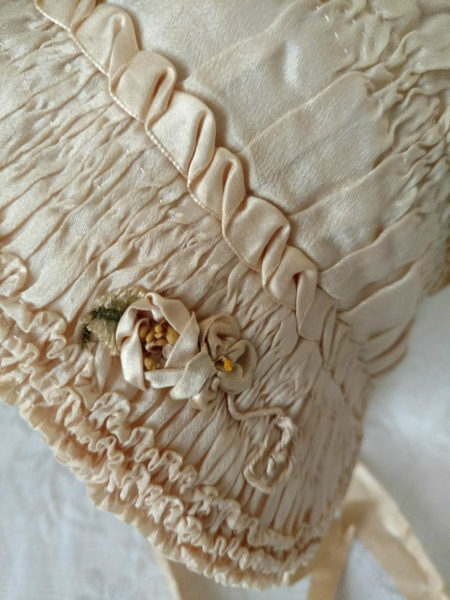 Dating from the 1920’s, the fancy silk, or rayon silk, bonnet boast of much shirring, ribbon work and tiny ruching ruffles embellishing the edge of the brim. The crown of the bonnet is also decorated with shirring. A pretty pleated edge features the neck line, as well as trims the inside lining of the bonnet. A single rosette decorates one side of the bonnet with a ribbon bow on the other side. Chin ties are silk ribbon with some shredding. Bonnet is fully lined in silk. The shirring and ruching are all hand stitched. Color is a pinky cream. A larger bonnet, which would fit a child about 2 years of age.